Below is a list of the supplies used by the project. If you would like to donate supplies, please purchase items on this list. Supplies can be dropped off at Resurrection Lutheran Church, 1919 Independence Parkway, Plano, TX 75093. 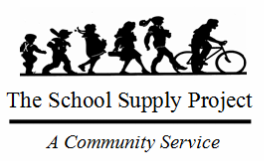 If you would rather donate filled backpacks, contact us at info@theschoolsupplyproject.org.